Blagoveshchensk is a Russian city that few English speakers can pronounce and even less can place on a world map. This distant outpost rests beside the mighty Amur River—one of the world’s longest—which separates Russia from China. Apart from its Chinese neighbors, Blagoveshchensk isn’t close to anything. The city is six time zones away from Moscow. Even the Trans-Siberian Railroad doesn’t go here. 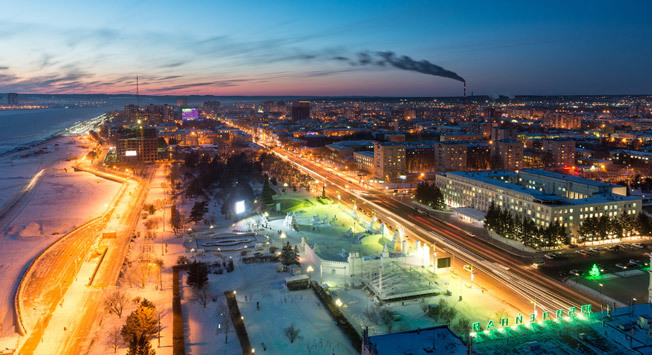 Although the far more famous cities of Vladivostok and Khabarovsk often eclipse the attention of most travelers who visit the Far East, Blagoveshchensk’s isolation is exactly what makes it an alluring place to visit. Given its proximity to China, Blagoveshchensk is ground zero for exploring the Far East’s unique relationship with Asia. The city also boasts a historic downtown of stunning tsarist-era buildings. In his 2001 cross-country trip across Siberia, The New Yorker’s, Ian Frazier, referred to Blagoveshchensk as the ‘handsomest’ Russian city he’d seen since St. Petersburg. Blagoveshchensk is a true river city. Arriving on one of the first warm days of spring, you see young men standing by muddy riverbanks tinkering with wooden boats. The usual Soviet drabness of many Far Eastern cities gets washed away here by a sort of river charm that works into the buildings and makes crumbling concrete appear picturesque. Imagine a far colder version of New Orleans with onion-domed churches and lots of Chinese restaurants. Russian explorers first attempted to colonize this part of the Amur by establishing the nearby Albazin fort in 1651, a venture that was soon destroyed by Manchurian forces. Two centuries past before Nikolai Muravyov-Amursky, the Governor General of Eastern Siberia, moved Russian troops into the region. Amursky succeeded in annexing the Chinese territory north of the Amur River to the Russian Empire and Blagoveshchensk was established in 1858. Russian presence on the Amur resulted in numerous conflicts with the Chinese. Today, it’s a different story. Blagoveshchensk, population 220,000, looks over the river at the Chinese city of Heihe, home to almost 2 million. Blagoveshchensk and Heihe are part of a special free trade zone which allows locals to cross back and forth on either side of the Amur. In winter, buses trundle over the frozen river. When the ice thaws in spring, hydrofoils skim over the water between the two cities. Russians cross the border into China to go on shopping trips, while crowds of Chinese tourists enter Blagoveshchensk daily to take city tours. Blagoveshchensk makes for an intriguing visit if you’re traveling across Russia by train. The nearest stop on the Trans-Siberian Railroad is the city of Belogorsk, conveniently located 110 kilometers northwest on a separate train line. The southwest journey to this border town passes through flat grasslands interspersed with birch groves. It ends on a wide stretch of water where the Amur meets the Zeya River. If you’ve just spent days in a cramped passenger train, the omnipresence of slowly moving water is a welcome change. Most of the city’s hotels, eateries, and architectural sites are located on Ul. Lenina, just a short ride from the train station, which runs parallel to the Amur River. Lenin Square is a natural starting point to begin a walking tour. From Lenin Square head east on Ul. Lenina towards Pl. Pobedy where a large bust commemorating Anton Chekhov’s 1890 visit to Blagoveshchensk stands. Chekov stopped here before starting the research for his book, Sakhalin Island. Along the way, stop at the Amur Regional Museum (165 Ul. Lenina) which contains exhibits on the Albazin fort, early Russian settlers, and native people of the Amur region. Alternatively, walk south from Lenin Square, take a right on the riverside promenade, and head west. You’ll soon come to a statue of Nikolai Muravyov-Amursky, the Russian General who paved the way for the city’s founding. Stop to admire the tsarist-era architecture that made the city famous throughout the Far East and take in views of the towering buildings and pagoda roofs of Heihei across the Amur. During the afternoon, head out on the water. Scores of Russian and Chinese locals travel between Blagoveshchensk and Heihe each day. For a real taste of this borderlands region, join them and take a ferry from Russia to China. From the Amur Regional Museum, head back east along Ul. Lenina and take a right on Ul. Chaykovskogo towards the Amur. Boats bound for Heihe leave from the River Terminal (1 Ul. Chaykovskogo) four times daily. If you want to visit Heihe, and plan on returning to Blagoveshchensk, you’ll need a multi-entry Russian visa. Non-Russians can pick up a Chinese visa at the consulates in Irkutsk, Khabarovsk, or Vladivostok. Even without a Chinese visa, you can still take a river cruise on the Amur during spring and summer. Boats leave from 1 Ul. Teatralnaya just east of the River Terminal. One of the most entertaining things to do in Blagoveshchensk is pop in the Chinese-run shops in the side streets downtown. They sell everything from clothes, toys, cell phones, and automotive parts imported from Heihe. Most Chinese in Blagoveshchensk can speak some Russian. Perusing the shops is a great way to strike up a conversation with some of these newcomers, or stock up on supplies for a long train trip. It seems there’s a Chinese restaurant on every street in Blagoveshchensk. If you’ve arrived in town after an epic trip across Russia, and have tired of pelmeni and borscht, you don’t have to cross the Amur to try authentic Chinese food. Locals swear the number of paper lanterns hanging outside a Chinese restaurant is indicative of the food’s quality—the more the better!